The Revival of North Carolina General Assembly Special Sessions and Why They Matter - Ward and Smith, P.A. In odd numbered years, after the North Carolina General Assembly adjourns its Long Session, the body typically abstains from lawmaking through the commencement of the Short Session the following spring. There is no statutory or constitutional requirement governing when sessions of the General Assembly must end or imposing any limits on the use of Extra Sessions, but North Carolina legislative tradition prior to 2016 generally allowed lawmakers to safely assume that they would not be summoned to Raleigh between the Long and Short Sessions for votes. The ability to call Extra Sessions, or Special Sessions as they are more often called, has been vested in the General Assembly since the North Carolina Constitution was ratified in 1971. Article II, Section 11 of the North Carolina Constitution allows the President of the Senate and the Speaker of the House of Representatives to jointly convene Special Sessions at any point during the legislative biennium. These flexible and irregular legislative periods were used only sporadically, and until recently, the General Assembly had not convened for a Special Session since September of 2007. Prior to 2016, the General Assembly had not called more than two Special Sessions in any year since 1959. But, legislative leadership's urgent interest in passing and later repealing the infamous House Bill 2 led to calling two Special Sessions in 2016, reviving the concept of the General Assembly meeting outside the regularly scheduled Long and Short Sessions. In 2016, House and Senate leaders convened a total of four Special Sessions. And, after repealing House Bill 2 during the 2017 Long Session, the General Assembly has since convened three Special Sessions for a wide range of purposes unrelated to House Bill 2, bringing the current two-year Special Session total to seven. The flexibility of Special Sessions offers the benefit of allowing lawmakers to respond to world events, natural and economic disasters, lawsuits, judicial mandates, and emerging policy trends in real time. Critics of Special Sessions argue that they keep lawmakers away from their districts, families, and primary occupations longer than necessary and without much predictability. Others point out that as the General Assembly's work is becoming increasingly year-round many potential candidates—especially those who work traditional full-time jobs like many constituents—are discouraged or unable to run for office. Typically a Long Session Adjournment Resolution would be sparse of detail other than the date and time that lawmakers would return to Raleigh for the next year's Short Session, but that was not the case this year. The 2017 Long Session Adjournment Resolution (Senate Joint Resolution 686) ordered the two chambers to reconvene on August 3rd and narrowed that session's purview to ten types of legislative matters. 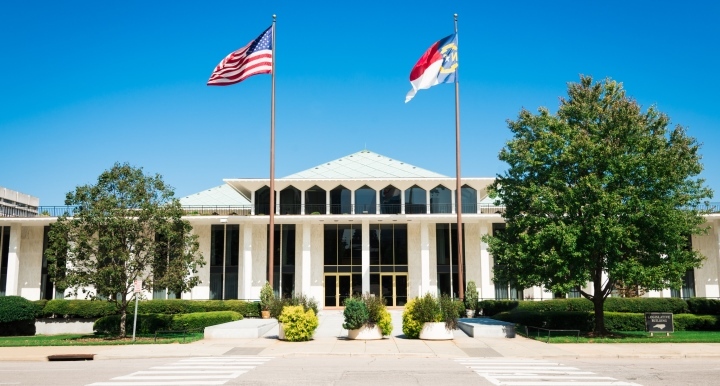 Permissible items included override of Governor Roy Cooper'a vetoes, appointment bills, bills responding to litigation involving the state, impeachment bills, and conference reports. The unusually early adjournment of the 2017 Long Session left a handful of House and Senate priority items unresolved at the session's conclusion, many of which were in conference committees on the day of adjournment. When the House and Senate pass two different versions of a bill each chamber appoints negotiators, called conferees, to work towards reconciling the different versions. The conferees produce conference reports, which are compromise bills. Allowing the conferees to continue their negotiations after adjournment and produce conference reports that could be voted on during Special Sessions later in the year enabled the issues to be better vetted while still ensuring that the priorities of leadership were enacted this year. Affording lawmakers additional time to negotiate complex issues can result in improved legislative outcomes and this proved both a productive and meaningful tool for the 2017 Special Sessions. The first of the 2017 Special Sessions convened, as ordered, on August 3rd when lawmakers returned to Raleigh after a five week hiatus to resume work on key conference reports. The primary purpose of this Special Session was originally to conduct veto override votes, but those votes were delayed due to the high number of absent members from both parties and the resulting uncertainty in the ability to secure the necessary 3/5ths margin of present and voting members to complete the overrides. The second 2017 Special Session opened on August 18th, but no votes were taken until August 24th. In this Special Session legislators directed their attention primarily to passing redistricting legislation, but also conducting overrides of a handful of the Governor's vetoes while also voting on additional conference reports and local bills affecting Brunswick and Rockingham Counties. The third 2017 Special Session opened on October 4th and moved several significant pieces of legislation, many of which are described below. The House and Senate also executed two veto overrides. Although the October Special Session has technically not yet adjourned for procedural reasons related to the timing of veto override votes, the formal work of that session has concluded and legislators are not expected to return for votes until the next Special Session, which has been set for January 10. This bill contained 49 sections of changes to the state's revenue laws ranging from minor clarifying revisions to substantive tax policy changes. These sections featured changes to the state's Tax and Tag Program, modification of the corporate income tax deduction for interest expense paid or accrued to affiliates, establishment of a new criminal offense for identity theft in tax matters, and a variety of sales and use tax changes. This legislation outlined the new North Carolina House of Representative redistricting plan which was enacted in the second August Special Session in advance of the federal court imposed September 1st deadline to redraw the maps. This legislation outlined the latest North Carolina Senate redistricting plan, which was also enacted during the second August Special Session to comply with the federal court imposed September 1st deadline to redraw the maps. Both HB 927 and SB 691 were enacted upon ratification because gubernatorial approval was not required. As the title indicates, this bill hosted a variety of environmental law amendments, including repeal of obsolete hazardous waste provisions, imposition of additional water quality testing requirements in the Catawba River, changes to the Coastal Area Management Act, authorization of a study of riparian buffer tax exclusions, repeal of the Outer Banks plastic shopping bag ban, changes to the laws governing solid waste management, and funding for GenX analysis, monitoring, and treatment. H56 was enacted after override of its gubernatorial veto during the October Special Session. This legislation follows years of debate over whether electronic means of public notice may substitute for printed public notices that generally appear in newspapers and other print publications. Under Senate Bill 181, Guilford County, municipalities within Guilford County, and the Guilford County Board of Elections are now authorized to adopt ordinances permitting electronic public notices and advertisements on local government websites in lieu of or in addition to publication in a newspaper. An earlier proposal to draft the legislation in a way that would impact all North Carolina counties was reportedly abandoned because the bill then would have been subject to a potential gubernatorial veto. This bill was enacted during the October Special Session. The bill modified the state's stormwater laws and also expanded an exemption from coastal stormwater rules for residential projects. This legislation also requires agencies and the Office of Administrative Hearings to provide additional notice of petitions for rule making. Governor Cooper vetoed the bill in August, but the General Assembly overrode the veto during the October Special Session. The companion bill to Senate Bill 16, House Bill 162, also advanced during the Special Sessions but has not yet been enacted. This bill accomplished a variety of technical and clarifying modifications to the currently enacted state budget while also adding new substantive policy changes. The bill corrected an issue with the budget that would have resulted in some North Carolina principals and assistant principals losing their longevity pay. It also contained a handful of sections modifying or relying on the Workers' Compensation Act as it relates to inmate wages and newspaper and magazine sellers. The bill also required the Attorney General to handle all criminal appeals by prohibiting their delegation to district attorney's offices. Perhaps most notably, this bill removed the 2020 statutory expiration date on the state's film production tax credit, extending the program indefinitely. The bill was enacted during the October Special Session. This bill, which also was enacted during the October Special Session, carried out a large number of appointments by the Speaker of the House and President Pro Tempore of the Senate to state boards, commissions, and authorities. Several of the Governor's appointments still remain pending and according to House and Senate leadership, will not be approved until January at the earliest. Notable items that did not gain significant traction during the 2017 Special Sessions include judicial redistricting, amendments to the North Carolina constitution, and impeachment of state officials. The October Special Session adjournment resolution left the door open for constitutional amendments, judicial redistricting, additional conference reports, lawsuit responses, and appointments in the January Special Session, but did not reference any Council of State impeachments. Love them or hate them, the concept of using Special Sessions to enact legislation throughout the year appears to be gaining traction as North Carolina begins to operate more like a year-round legislative body.